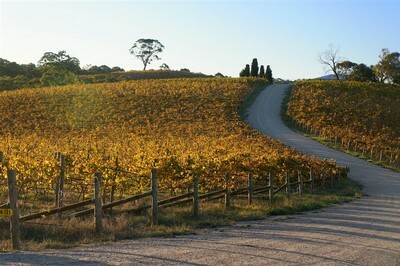 “A very dry and warm growing season meant early flowering and put us on track for a very early start to harvest. Large rainfall events in the first half of January provided welcome relief for many vineyards in the area, especially dry-grown. Vineyards that were looking dry bounced back with healthier-looking canopies – our Clarendon vineyard (which has very limited water supply) improved out of sight in the space of two weeks. “The rain, in conjunction with mild January temperatures, slowed down the rate of ripening. As a result, vintage started just slightly earlier than normal. “As the temperature warmed up, so did the rate of ripening. This was helped along by the recently invigorated canopies from the rain events the month before. The warm and dry conditions continued through February. The result was a very short and condensed vintage period. Logistical pressure on wineries was high, but those who had the fermentation space and the availability of harvesters no doubt pulled in some of the best quality fruit the Vale has seen in years. “Fruit concentration and expression is very high. Varietal expression across all varieties is strong, showing a broad spectrum and depth of flavour. Natural acidity held up extremely well (the best I have seen) which also helped to preserve the condition of the juice. Sunday 5th April CLOSED - HAPPY EASTER! We look forward to welcoming you for a free tasting of our Primo Estate wines or you may wish to book for a sit down flight our our premium JOSEPH wines and Extra Virgin Olive Oils accompanied by a small tasting platter of bread and cheese in our JOSEPH Experience. There is a $15 per head cover charge for the JOSEPH tasting which is refunded upon purchase from the JOSEPH range. To book your JOSEPH Experience Tasting please call: 08 8323 6800, booking is advised as spaces are limited. Join us for a celebration of all things Venetian at this relaxed cellar door lunch. You will be greeted with a glass of our newly released Primo Secco sparkling white. Joe flies to Italy every year to make our Primo & Co The Venetian Garganega just outside Venice. The newly arrived 2014 vintage will be perfectly paired with a classic Venetian fish stew. Our Zamberlan Cabernet Sangiovese is made using the Venetian 'Ripasso' technique where young wine is pumped over the dried grape skins from our JOSEPH Moda to make a rich, full-bodied red, perfect for the cooler days of autumn and delicious paired with some seasonal local lamb. The lunch finishes with a selection of cheeses accompanied by our rich, spicy Shale Stone Shiraz. Gather a group of friends and book now for this relaxed lunch at McLaren Vale's most stylish cellar door. To celebrate the launch of our new Primo Favourites Club we gave away a magnum of Primo Estate Il Briccone Shiraz Sangiovese valued at $65. Congratulations to our winner: J. Nunn of Queensland! We hope that you enjoy your prize. Thank you to everyone who entered our competition. The winner was drawn at random on 10th March 2015 and notified by email. Adelaide Pizza Party - NEW Third Night Added Due to Popular Demand! Tuesday 24th March - NEW date added due to popular demand! Joe and the team are taking a trip into town; celebrating Primo Estate's 36th vintage with two fabuous evenings at Hutt Street's Milano Cucina. Our annual dinners at Milano Cucina have become an institution and as always Paolo and his team will lay on a feast of great dishes perfectly matched to our wines. The vineous highlight of the evening will be our Italy vs Australia taste test as we pour our two Shiraz Sangiovese, Il Briccone (grown and made in McLaren Vale) and The Tuscan (grown and made in Italy). Poured side by side this unique comparative tasting allows you to vote for Italy or Australia; which wine will you prefer? Invite your friends to share the fun at Adelaide's best value pizza evening. We look forward to seeing you there. Just $59 for eight dishes plus wines - book now! Every bottle of 2012 JOSEPH Moda sold by us in cellar door, at one of our wine dinners, over the 'phone or online earned one entry into our prize draw. Thank you everyone who entered. With 1,297 entries the lucky winner was David Macnaught of Queensland with runners up Rodney Miller, David Lewis and Kevin McDermott each winning a magnum of 2012 JOSEPH Moda. We can't wait to celebrate David's win with a very special lunch! Sydney Primo e Pizza Evening March 2nd & 3rd - Come and Share the Fun! In a bowl, drizzle JOSEPH oil on the calamari along with 1 tablespoon of chopped parsley, salt, pepper and garlic. Mix and set aside for at least 15 minutes. In a seperate bowl combine the remaining 2 tablespoons of parsley with the breadcrumbs. 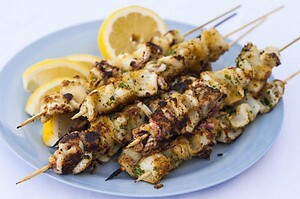 Roll the calamari through breadcrumbs and skewer. Grill for 2 to 3 minutes on each side and serve immediately with a final drizzle of oil and a squeeze of lemon juice.